The most noteworthy changes are the move from a 2GHz Marvell mv628 Kirkwood single-core CPU to a 1.06GHz Freescale QorLQP1022 dual-core CPU and the memory interface has been boosted from 16-bit to 64-bit as well. With so many NAS features available, such as media streaming, cloud computing and even photo editing using the included Pixlr Editor possible, a dual-core CPU is an increasingly popular choice. 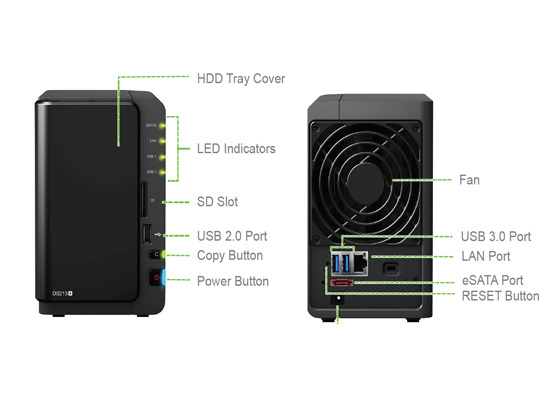 The DS213+ is equipped with two rear USB 3 ports and a rear eSATA port, while the front houses a USB 2 port and SD card reader. The latter ports may be useful if you plan to house your NAS in an easily accessible location, as the one-touch copy button can enable you to dump all the photos from your latest holiday directly onto the NAS. From here, you can share them with Facebook, Picasa or your blog, or back them up to one of the many online backup services in minutes. Meanwhile, the unit’s large 92mm fan is extremely quite, and it occupies the entire width of the case at the back. This means that housing it in your living room is a distinct possibility, as won’t draw attention to itself. This is just as well, as one of the biggest additions to the new OS is a video playback and recording facility. You can now record live TV using supported USB TV dongles, and even configure your recording schedule using an iPhone while you’re out. However, it’s limited to VB-T broadcasts. Synology is also making a big push into cloud computing and, by sig its Cloud Station app and free DDNS hosting, you can create your own free Dropbox-like cloud storage. Speed-wise, the DS213+ is also one of the fastest NAS boxes we’ve seen. It was able to read data at 92MB/sec when dealing with our torturous small file test. These speeds dropped to 70MB/sec and 26MB/sec respectively when writing the same data. Even so, this is so fast that you’ll need a 1GB/sec router and CAT5 cable in your house to be able to take advantage of these speeds. 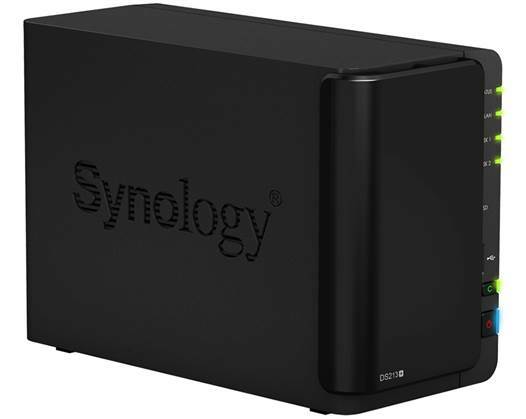 The DS213+ is another solid effort from Synology. 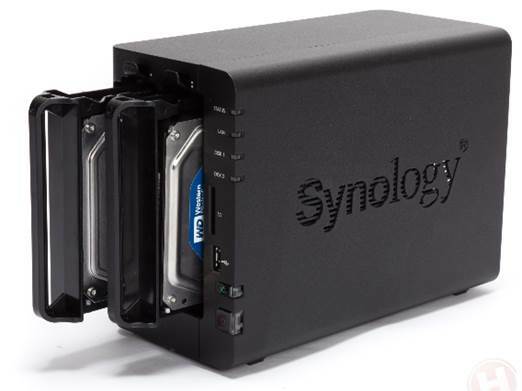 It doesn’t sport many upgrades over previous models, but the move from single-core to dual-core helps it to deal with the increasing number of tasks that Synology’s NAS boxes can perform. It’s pricey unit, though, especially considering it’s unpopulated, and $435 can buy you a half-decent Socket FM2 media PC. However, if you want a NAS box, the DS213+’s fast performance and the superb DSM4.1 user interface, make it the best dual-bay NAS box we’ve seen. § 3.1GHz Intel Core i3-2100 CPU, MSI H6 1L-E35 motherboard, 8 GB Corsair 1,600MHz DDR3 memory, Corsair 128GB X128 SSD, Corsair CX400W PSU, Windows 7 Home Premium 64-bit.